Le Phare du Cap Bon Harissa. 70gm. 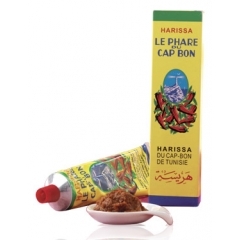 Home > Spices > Le Phare du Cap Bon Harissa. 70gm. Firey Harissa paste ready-to-use. Spice up your next Kiwi BBQ the Tunisian way! This Harissa paste is from Tunisia. It is very very hot! You can use harissa as a condiment with meat or you can add it to dishes for that chilli kick. Ingredients are red hot pepper, garlic, coriander, caraway, salt.